Louie Sakoda, former Utah Utes All-American and CFL Kicker/Punter has become a private kicking coach at Kicking World. Louie will conduct punting and kicking lessons in Charlotte, North Carolina. Louie Sakoda, former Utah Utes All-American and CFL Kicker/Punter has become a private kicking coach at Kicking World. Louie will conduct punting and kicking lessons in & around Charlotte, North Carolina for the leading instructional kicking, punting & snapping camp in the world. Who is Louie Sakoda? Uh, he’s kind of a big deal! Louie is the only ever unanimous Consensus All-American in Utah football history, second player ever to be named a Ray Guy and Lou Groza finalist in the same year (2008), three-time Ray Guy top 10 semifinalist (2006-08) and two-time Lou Groza Award semifinalist (2007-08), and the list goes on! Read about all the career records Louie set and all of his academic & athletic accolades on the official University of Utah Utes player page. Louie Sakoda had a storybook kicking & punting career as a walk-on at the University of Utah and he later went on to play professional football as a kicker & punter in the Canadian Football League (CFL). He is one of the best kickers who ever came out of college and many experts expected him to be playing several years in the NFL. Sakoda, or ‘King Louie’ as many call him, had a fanatical following not only for his epic performances for Utes Football, but also for his ability to go about life and football with a confident, but down to earth swagger that won over his fans, teammates & coaches. Plagued by a few injuries on his journey from college football, to the CFL and later a brief stint in the NFL; his amazing career was unfortunately cut short. Coach Brent Grablachoff (Owner & Head Coach) of Kicking World and Louie Sakoda had some time to catch up and talk about Louie’s college football career, life experiences, what happened after college, what he’s doing now and how he’s now a part of Kicking World. Enjoy the interview with Louie Sakoda – who is also on the Bleacher Report Top 25 Clutch Kickers in College Football History! What is your fondest college football memory? Though I was fortunate enough to have quite a few, my fondest college football memory would have to be my senior year season opener against Michigan at the Big House. We were coming off of a decent season the previous year, but we were definite underdogs by the fans’ standards, and by the point spread. My first kick of the season was a punt out of the back of our own end zone (it figures). With nerves already shaky, I boot a terrible end-over-end ball that fortunately had a nice 20 yard roll. After that, the nerves were gone and I went on to have one of my best kicking and punting games of my career. I went 4 for 4 on FG’s, with a long of 53, and had 6 punts for an average of 47 yards. As each field goal sailed through, I had no idea the impact they would ultimately have on the game. Michigan staged a late comeback and we narrowly won 25-23, proving that the margin of victory could have easily gone the other way with one mental lapse on my part. I miss the brotherhood and the discipline. There is nothing that brings a group of people together more than going to battle together. You sweat, you bleed, and you put yourself through torturous workouts all in the pursuit of a common goal. In the classroom, the weight room, and on the field, you can look next to you and find one of your brothers to help you push through difficult times. You simply do not see that in some corporate office or intermural flag football team. Your teammates are not only a source of inspiration, but they keep you accountable. You know that if you decide to sleep through your 5:00am alarm and miss a workout, you are not only going to be punished, but you will be letting your teammates down. I have never been more motivated than when I was playing college football. What was it like to be a professional kicker in the CFL? Transitioning from college football to the CFL presented a number of challenging variables that I was not entirely prepared for. The biggest challenge was the constant state of flux that your career is in. When you’re in college, you know that unless you break certain rules, you will be with your team for a number of years. At the professional level, it is all business. You may sign a large contract, but there is nothing guaranteed about it. If you have one bad kick, you could be packing your bags the next day. This not only adds a whole new element of pressure, but it has a huge impact on team unity. So many new players are being brought in every week and you lose many of your close friends without a moment’s notice. Overall, it does not compare to playing college football (except a healthy paycheck each week). Everyone in the football community, especially Utah Fans thought for sure you would have an NFL career. What do you think happened? If I had to pinpoint one thing that held me back, it was my maximum distance range. After my last collegiate football game, I should have drastically increased my training regimen in order to build up my frame and add 5+ yards on my ball in all facets. If I could go back, I would seek professional training to set higher-reaching goals and keep me on pace to reach them. Do you have any tips for aspiring kickers to help handle kicking in a pressured environment or big game? This is one of the most common questions that I get asked and I always respond with the same answer: Have a Process. What I mean by that is when you step on the field; you should be doing the same thing every time. Some players might go through a superstitious ritual before each kick. It’s up to you. For me, my process is all mental. As I jog out to the field, I check the wind conditions and then assess the yard line and hash mark. As I take my steps, I simply let my conditioned mental voice take over and remind me of every technical step as I walk through it. Not only does this keep me from forgetting minor details, but it also keeps my focus away from the roaring crowd and the pressure surrounding the situation. How did ‘King Louie’ come about? The whole King Louie nickname started with one of the Utah gymnasts. They always called me that after the character in The Jungle Book. Somehow a local reporter caught wind of it and published it in their next article. From there it caught on like wildfire and I have not heard the end of it! You kicked and punted in college, what did you like better and why? Each form of kicking has its perks. There is nothing quite like kicking a game-winning field goal. But there is nothing more beautiful than watching a perfectly spiraled monster punt completely flip the length of the field. If it came down to it, I can easily say that punting is a much more difficult art to master, but for that same reason, it is much more fulfilling. What do you look forward to most now as a coach? As a coach, there is nothing more rewarding than tracking the success of a student that you have worked with and helped mold. No matter what stage of development a specialist is in when I first get to see them, their personal growth is the only thing that matters. I look forward to helping kids break personal records they never thought they were capable of. Do you have a philosophy, principles, or words to live? No matter how naturally talented a student is, you only get what you put in. No matter how many coaching hours a student gets, they will not get any better if they do not buy into the system and implement what they learned. Instructors can show kids the fundamentals & technique of how things are done. However, it’s ultimately up to the student to train hard and stay dedicated to the game-plan. There needs to be strong internal motivation for an athlete to rise up and be one of the best. What are some of your hobbies/interests besides football? I am kind of a geek when it comes to technology. I like computers, video games, and pretty much anything with an on/off switch. I love the outdoors as well. My wife and I enjoy fishing, camping, and hiking. I have recently gotten into mountain biking as it presents a whole new set of athletic challenges, as well, acts as a great source of cardio! Tell us about your full time career and how that got started. With a marketing & entrepreneurship degree, I have started a number of ventures. I just launched a small branding agency, StudioSak (www.studio-sak.com) that focuses on small to medium-sized businesses. We develop logos, websites, marketing collateral, and help with social media essentials. I have always had a love for creative technology and this field is exciting and ever-evolving. It’s quite the detour from being an athlete, which is exactly why I am very excited to join the Kicking World team. Louie Sakoda is originally from San Jose, CA, played college football in Salt Lake City, UT and now resides in Charlotte, NC with his wife. 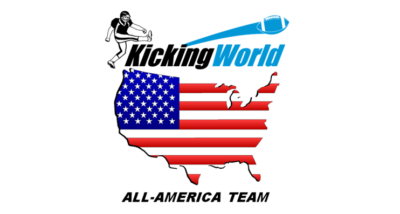 As a private kicking coach at Kicking World he offers 1 on 1 kicking and punting lessons in Charlotte, North Carolina and surrounding areas. He will also travel with Coach Brent and the rest of the Kicking World staff to select kicking camps around the nation. He will continue utilizing his marketing & entrepreneurship degree for various business ventures and will also offer private instruction for all levels of kickers & punters in North Carolina. If you would like to train with Coach Louie Sakoda, visit www.kickingworld.com and get started today.